Fish-friendly changes made to the Rivers Frome, Piddle, Asker and Brit by the Environment Agency and partners. It is now easier for salmon and sea trout to migrate up some of Dorset’s best known rivers thanks to the efforts of a unique partnership that has been working to boost fish numbers by removing man-made obstacles such as hatches and weirs. Improvements at 10 sites on the Rivers Frome, Piddle, Asker and Brit have made it possible for fish to swim upstream to spawning grounds for the first time in many years. 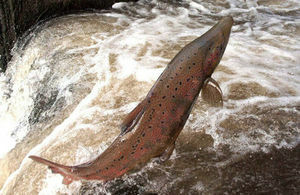 As well as salmon and sea trout, removal of barriers will help other species including eels and coarse fish. The work has been carried out by the Environment Agency, Frome, Piddle and West Dorset Fisheries Association, Westcountry Rivers Trust and the Friends of Rivers Group. It has been a real success with each organisation playing a specific role. None of us could have achieved the work on our own. We’ve shared expertise, experience and costs to remove these barriers to fish passage. It’s an excellent example of partnership working. We’ve removed 10 significant obstacles that were stopping fish moving upstream. The work has made a real difference to these rivers. Improvements ranged from simple solutions that took only a few days to put in place to major engineering works such as fish passes. To celebrate their success, the partnership held a special event at Frampton, Dorchester on Friday 22 April, where representatives from each organisation showcased their work and gave people a tour of one of their latest projects – a new fish pass at Crockway House. Barriers have been built on many rivers over the past 100 years to control water levels. Unfortunately, this has prevented migratory species such as salmon and sea trout from reaching the headwaters to spawn. This restriction of movement combined with issues like pollution has led to a decline in fish numbers in some rivers. These factors not only impact on the ecology of our rivers, it also affects those who enjoy the water environment.